You can now find me and quite a lot of my books on LibraryThing. 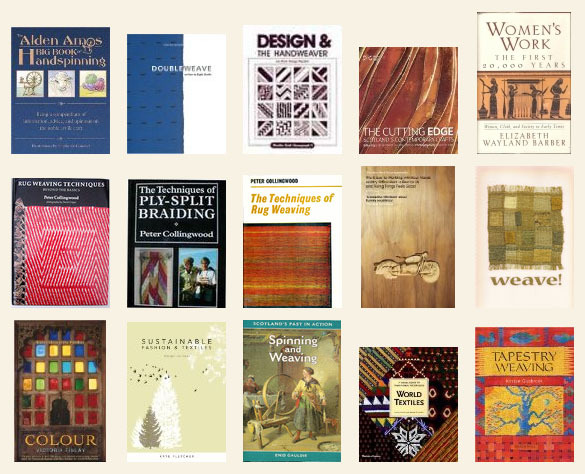 In an amazingly short space of time I have been able to add most of my weaving books and some spinning, general textiles, craft etc. There are still a few embroidery and surface design books lurking in the darker corners of the loom room. Then there is the rest of the house… but that is never going to happen. I was hoping to put a LibraryThing widget in the sidebar, but it is one of those apps that WordPress doesn’t support (yet? ), so here is a little screenshot to be going on with. Who is the author of the ‘Colour’? That’s a new one to me…. Also The Cutting Edge? Anyway, “Colour” is a reading book (as opposed to a practical book; subtitled “Travels through the Paintbox”) by Victoria Finlay. “The Cutting Edge” is edited by Catriona Baird — it was produced by National Museums Scotland to accompany an exhibition of contemporary craft and appears on their website here.